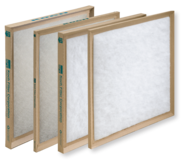 We offer a complete line of economical air filters designed for light-to-medium duty air filtration applications. Stocked Multi-Pleat or Commercial & Industrial Disposable panels available. Our filters maintain an ongoing Quality Assurance Pro-gram (QAP) to insure complete customer satisfaction with every filter we ship. In-house inspections are reg-ularly verified by independent test laboratories. These independent tests are conducted in accordance to all current ASHRAE Standards.